ThermaCote® Roof Repair Tape is the ultimate leak and seam repair tape. It is the heaviest, most aggressive sealing tape available, and permanently deal with leaks in virtually all roofing materials, including for TPO, EPDM, and metal. ThermaCote® Roof Repair Tape is VOC- free, and the perfect reinforcement for all non- leaking seams to add additional security around curbs, vents, chimneys, AC systems, antennas, and all other roof-penetrating devices. 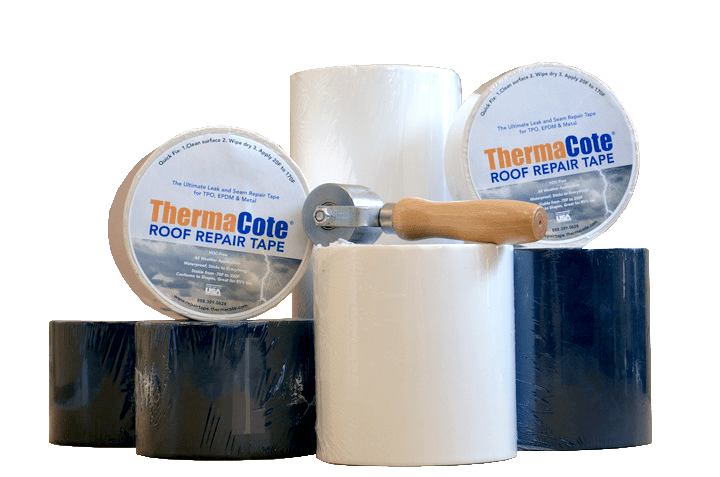 ThermaCote® Roof Repair Tape is stable from –70˚F to 200˚F. It is easy to apply to any clean, dry surface*, and is flexible. It also readily conforms to shapes, making it well suited for gutter repairs, piping or other curved equipment. Our tape is available in 2 backing colors: white & black. It is UV resistant for assured longevity, and its patented adhesive technology creates permanent repairs on virtually all roofing materials. It can safely and effectively be used to stop water or air penetration on many other surfaces including cement, plywood, OSB, and metal. It can also be used to stop leaks on mobile homes, RVs, rail cars, trucks & vans, garden sheds, tarpaulins, and some unpressurized piping. *For applications below 32˚, a primer is recommended. ThermaCote® Roof Repair Tape cannot be torn by hand. You must use a utility knife or similar tool. 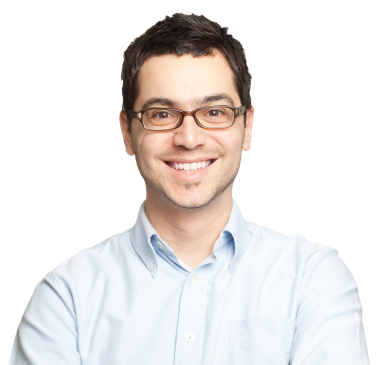 Removal of tape may require mechanical intervention or high strength solvents. 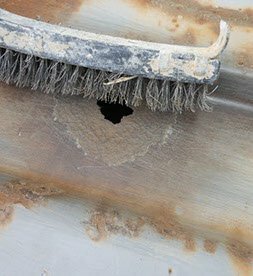 DO NOT apply ThermaCote® Roof Repair Tape to any surface with the expectation that it will be readily removed without affecting the surface to which it is applied. *To read more about ThermaCote weather barrier, click here. 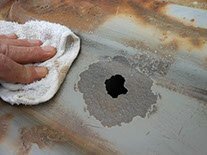 Make sure the area to be repaired is clean and dry. For applications below 32˚ a primer is recommended. Remove any loose material. If there are any oil- based residues, remove them with an appropriate cleaner. Cut the required length of ThermaCote® Roof Repair Tape and remove release coating from the inward-​​facing of the tape. Press into place by hand, then roll with a hand roller to force adhesive into any surface irregularities.